With this meter, you can survey for alpha, beta, and gamma radioactivity or monitor a work area. A thin end-window probe with a T-1140 tube comes with the unit. You can attach this probe to the unit with a handy side mount for one-handed operation. The meter has a permanent magnet speaker and an easy-to-read meter. You can read your results in cpm from the meter or add one of the included transparent mR/hr cards to read radiation dose rates at the same time. The speaker is controlled by an on-off volume switch and responds directly to radiation intensity. Another switch on the panel lets you choose between the meter’s four ranges: 0—500, 0—5000, 0—50,000 cpm, and a battery check. If the unit needs calibration at any point, a simple screwdriver adjustment is all that’s required. Power comes from two installed 9V batteries. All Geiger counters sold by VWR Education Companies are for educational purposes only. They will measure different types of radiation including alpha, beta, gamma, and X-rays, but they should not be used for any health, safety or medical purposes, or to determine a human being's safety in an area that is suspected of radiation exposure. 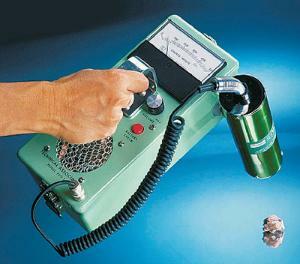 Our Geiger counters will detect different types of radiation, but unless you know how to properly calibrate them and interpret the data, these Geiger counters should not be used to determine safe or unsafe levels of radiation exposure.